A fireball flashing through the sky has been reported by multiple witnesses and also recorded on dashcams in Perth, Western Australia. Scientists believe the bright shiny object could turn out to be a meteorite. 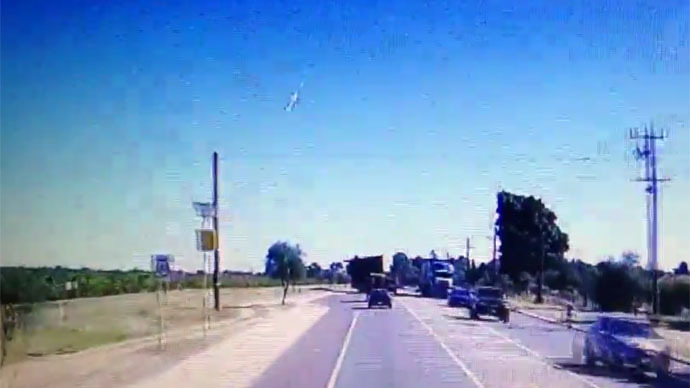 Reports of the fireball as well as its dashcam images started to emerge on Monday morning. “Don't know what it was but whilst on a break at work, was walking back to the workshop and saw a bright flash and an object falling through the atmosphere with a white bright lit tail,” Perth resident, Chris Ugle, posted in a Facebook group titled Australian Meteor Reports. A resident of Gidgegannup (45km east of Perth), Angela Whife, described the fireball as round, white and having a meter-long tail. She believes the object landed on her property. “It would have been about 10 meters above the ground I suppose when I first saw it and then it landed about 20 meters away from me,” Whife told Perth Now. The object has yet to be found though. One of the witnesses called 720 ABC Perth's Morning program to say the fireball “vaporized in a burst over the [Canning] river." I just saw a massive falling star - a lot bigger than a star though, I hope it wasn't a falling satellite!! I hope everyone in Perth is ok!! Scientists are meanwhile studying dashcam footage of the fireball. One of those was captured by Nine News cameraman, Gerard Price. 'It would have to have been a fairly big rock to be visible during the day,' Curtin University's Professor Robert Bland, who hosts the Fireball in the Sky website, told Radio 6PR. Bland’s colleague, Jay Ridgewell, told AAP they were confident the fireball could be meteorite. "Thousands of meteors fall from the sky every year, but it's not as common to see them in such a populated area," she said.